I tend to divide the Hermessences into three categories: the few I don't care about at all (sorry, Paprika Brasil), the few that I need in 100 ml (Osmanthe Yunnan! ), and the rest, which I generally need in 15 ml (Vanille Galante, for instance). Sometimes I'm wrong, of course; I think I'm now on my third 15 ml bottle of Vetiver Tonka and my second of Rose Ikebana, and I'm heading fast towards another bottle of Brin de Réglisse. Cuir d'Ange, for now, is going in the 15 ml category — I'd like to own some but I'm not at all sure I'd run through 100 ml. Of course, the likelihood at this point of my running through 100 ml of anything is pretty slim. So Cuir d'Ange was inspired by the delicate leathers in the Hermès workshops, and as I said in the fragrance announcement, you may remember that Ellena styled the soft leather notes used for Kelly Calèche as "cuir d'ange" — angel leather, after a phrase from Jean Giono's novel Jean le Bleu. But the first thing I thought of on smelling Cuir d'Ange was not Kelly Calèche, but another, much older Jean-Claude Ellena fragrance, Frédéric Malle L'Eau d'Hiver — Cuir d'Ange could be its leather flanker or somesuch. The opening is bright zesty citrus, already peeking towards the leather at the base. It's not, for those of you who are serious leather fiends, your standard perfume leather with its rough edge of birch tar, that said, it does smell leathery, or perhaps in perfume-speak, something closer to suede. So a soft leather, yes, but more direct and focused than the leather in Kelly Calèche, and a leather gently perfumed with the cloudy-grey, velvety flowers of L'Eau d'Hiver: iris, hawthorn, heliotrope. (They're using a lovely creamy tan on the bottle caps, see below, but the juice reminds me of the pale "flax blue" of the Hermès briefcase shown above.) It's musky and lightly sweet, and a touch powdery. If you can imagine a leather comfort scent, this would be it. Cuir d'Ange, like many of the Hermessences, is not a powerhouse in terms of sillage or lasting power. Verdict: Cuir d'Ange is lovely and I suspect it will be a big hit with fans of the Hermessence series, men and women. Victoria at Bois de Jasmin noted that it "doesn’t smell like a perfume but rather like a second skin", and that's apt; it made me think of what the softest leather jacket might smell like in the morning, with the remains of last night's powdery floral perfume lingering on the lapel. It's going right on my buy list. The quick poll: what note or raw material do you wish would join the Hermessence series next? I'm still waiting for jasmine. Hermès Cuir d'Ange is available in 15,1 100 (€185) or 200 (€299) ml Eau de Toilette. A leather sheath for the 100 ml bottle is sold separately. I am not sure when Cuir d'Ange will launch in the US, but it is already available on several Hermès websites (I did not do an exhaustive search, but found it on the sites for France, Spain, Canada). 1. The 15 ml bottles are sold in "discovery sets", 4 bottles per set. So you can't buy them separately, but it's not all that hard to find people to split sets, and single bottles turn up on eBay from time to time. I was really looking forward to this one, as I am a real fan of quite a few of this line. However, as with the last fragrance, I simply cannot wear this as I detest any cumin and to me this fragrance has too much cumin. It is a shame as I was looking for a smooth leather perfume. So interesting…Epice Marine had plenty of cumin to my nose (and so do several other JCE fragrances), but I don’t notice it in Cuir d’Ange at all. A smooth leather? Try Lancome’s re-issued Cuir. To my nose though, it’s reads as less than a butch leather fragrance and more like a ultra-soft suede. This is the first one in this line that really intrigues me. Thanks for a thorough and enjoyable review. I am sorry to hear this is not long lasting though, I hope it is for me. Trying to remember which ones last longer than others. Ambre, maybe, and Vetiver? But most of them are short lived. Thank you for the review, as always–I am looking forward to this one. I wonder what the first Nagel Hermessebce will be? I wish the website had more of the Hermessences available for the travel set. Sometimes there are only two or three. Yes, they almost never seem to have them all. And the Cuir is not yet in 15 ml on the French site either. 100% agree on Osmanthe Yunnan – vats, please! And Cuir d’Ange is going on my “sample very soon” list – it sounds lovely. I was wondering actually if the 2 would layer nicely, but have not had time so far to investigate. I got two samples at my local Hermès store and the first sniffs were rather disappointing. What I got was basically a soft leather, very linear, with the flowers barely noticeable. But after testing it for several days it grew on me and now I like it enough to include it in my next 15ml bottles set (no 100ml of anything for me if I can help it). I was surprised that the leather smell is so realistic – with Ellena behind it I assumed it would be more abstract! Oh, the poll! I would love them to do an incense scent! I would love incense too! Seems unlikely from JCE though. I find it realistic too, but not in the way that most leather perfumes are. Will be interested to see how many people think it is too soft. Oh my goodness, as a huge fan of leather, JCE and L’Eau d’Hiver I am pretty much salivating here, especially given the “more direct and focused than the leather in Kelly Calèche” description. Must try asap. It sounds like it could be the 4th choice (alongside 2x OY and VT) for that travel set I’ve been thinking about getting. And hope you’ll like it! And I’ve been meaning to talk to your cats too (I don’t have any cats, hope you are willing to share yours). Oh, sure thing. All they need is a credit card and they’ll happily treat you to whatever you choose! Cats don’t come with their own credit cards?? I had to chime in when I saw someone else had opted for 2x OY! The others I chose were Paprika Brasil (sorry Robin) and Poivre Samarkand, both of which have reasonable longevity and sillage on me. Hey, I’m the one who is sorry for not appreciating PB! We agree on the OY, anyway. Even though the lasting power might not be very good, I am still really intrigued to try this. Bottega Veneta edp, currently my favorite leathery floral/oriental, doesn’t last terribly long on me, either, but it is so wonderful I don’t mind reapplying. I’d love to see JCE take on almond, heliotrope or patchouli for the Hermessence line. Or maybe something with violet. With the travel/discovery 15ml sets, can one mix and match fragrances or must they all be the same scent? Thanks. You can mix & match, but only from what they’ve got available at the moment. The stores often have a different mix from what’s online, so worth checking around to find what you want. Golly, maybe I’m lucky but I get all day longevity out of three small spritzes of BV. It’s also very wearable compared to my other soft leather fave, Cuir de Lancome. By comparison, Lancome ‘ s Cuir seems a throwback to an earlier, grander, less casual era of perfumery. It’s magnificent, and I feel I betray it every time I reach for BV, but, well, there we have it. I’m certainly going to try Cuir d’Ange, but I suspect its poor longevity will annoy me. I expect my perfumes to work hard, like I do, not go drifting off into the clouds just because they feel like it. BV & Cuir de Lancome are my top two favorite leathers. I also love Sous le Toit de Paris by Atelier, violet & leather. Violet would be my choice for a note they should create a Hermessence around. And I do love Brin de Réglisse. Brin de Reglisse is really a great scent. I do forget to wear it, and then I’m surprised again how great it is. And I’d say the same of FM Hiver, which is so lovely and I almost never think to wear it. Floragal have you tried Cuir Fetiche by Maitre Parfumeur et Gantier? To me it’s a like a more heavy duty CdL. Ha…not sure this one will work hard enough for you, but it’s worth a shot. Oh I’ll give it a try. I get several good hour out of Osmanthe Yunnan, so maybe I will be lucky with this one. Oh, I didn’t mean it was *that* short-lived. I get several good hours out of this one too, and maybe even a bit more than Osmanthe Yunnan. Sounds totally up my alley. Must try ASAP. Hope you’ll like it, and hope some people will come report back when they try it, it’s always good to get more opinions! Woefully behind on testing the Hermessences, but really want to try this one, plus Rose Ikebana, Iris Ukiyoe, and Brin de Reglisse. Seconding jasmine for next in the series. We need a good new jasmine! Iris Ukiyoe never did grow on me. I thought I liked Rose Ikebana but didn’t love it, but turned out I drained 15 ml in no time. I think now I’m happier with the sort-of-similar Pamplemousse Rose, though? I’m a bit scared off from a comparison to L’eau d’Hiver: a Jean Claude Ellena I wouldn’t sample again. One of two that win that distinct pleasure from me! That said, I still can’t wait to try it. Epice Marine really took my breath away! I’m in the same boat about his retirement. But as I posted on Grain de Musc, he’s so passionate I doubt he’ll ever really stop composing. Dying to know what the other is! Ambre Narguile. Like having a crushed red velvet pillow smothering me. I admit it’s well done and an interesting take on amber but never again. I am very curious about this one, does it bear any resemblance to Bottega Veneta Legere? So far I only need Osmanthe Yunnan and Brin de Reglisse in 100ml but I do enjoy most of them. No, not really. It’s closer to the EdP but not really all that like it either. Just a different sort of leather note, and less fruity, and less chypre-y. I´d love JCE to do a Mimosa Hermessence. One that would work hard and last, since I´m wishing. Oh, now that would be interesting! Never thought about that. Thirded! I’d love a tobacco fragrance. But I heartily second violet leaves or jasmine. I adore (and I mean really adore) the clean lavender opening of Brin de Réglisse, but I don’t get a lot after that. Is there anything else that has that beautiful clean, bright lavender? Cuir d’Ange sounds good. I recently tried Naomi Goodsir’s Cuir de Velours (thanks to one of the beautiful perfume enablers that are such a wonderful part of this community). It was a lovely soft leather too. Is there any similarity between the two? I tried Vetiver Tonka very early after falling seriously down the perfume rabbit hole and before my vetiver love fully manifested itself, so I should revisit it. And Épices Marine intrigues me… And I need to retry Pamplemousse Rose… the wishlist groweth evermore! I have not tried the NG so will be no help, sorry. Seems to me that most fragrances with lavender now use a molecular fraction of one sort or another…so most newer stuff with lavender is a clean, bright lavender. But it’s not a terribly popular note. You could try the Burberry Brit Rhythm. Hope someone else will chime in, there must be others I’m not thinking of! Did you try the Ambre Narguile? Wonder if you’d like that one. Ambre Narguile is nice but a bit on the sweet side for me. Caron Plus Belles Lavandes, Guerlain AA Lavande Velours.. neither are readily available but when they pop up they’re usually quite cheap. I have been wondering about that. Thanks for adding it to the list. I recently did a split of two sets of the Hermessences. I asked the participants for their choice of samples but no promises that I would be able to fulfill the requests. Overwhelmingly, people were curious about Cuir d’Ange. Unfortunately, the boutique on Madison Ave did not have a tester, let alone samples! I have to walk over again to obtain my sample. Since it is.a longish walk, i probably won’t get to it for another few weeks. As to the poll, I would love JCE’s take on Tobacco & hay. I love leather – but of the Bandit or Bel Ami variety. I’ll give this a sniff just to try it out! But can’t hurt to try! I can’t remember the last time that I so eagerly awaited a review. I love leather, love JCE, and can’t wait to smell Cuir d’Ange. I’m glad that you liked it (but sad that you didn’t love it). Can you compare it to the Les Exclusif version of CdR? To me, CdR certainly smells like a 2nd skin in its current version. I wore the pure parfum version of Kelly Caleche today after putting it away in a box for a while– and man, what a lovely perfume this is, in parfum. It’s so smooth, with leather peeking out unexpectedly throughout the day, like catching a glimpse of someone just as she turns a corner and leaves your vision. So pretty. I am not head over heels, but I’m more enthusiastic than just “like”! It really is a lovely scent. I can’t compare to the new CdR, which I haven’t smelled. I was curious about it for awhile, then decided I’d rather not know. But I can say that the original CdR leather is exactly what I think of as “perfume leather”, and this is like something completely different but still leather…you will have to try it and you’ll see what I mean! It doesn’t really smell clean to me (although V, in her review, I think mentioned “soap bubbles”) but it doesn’t smell like raw cow hide either. Now I’m lemming the Kelly Caleche pure perfume. I LOVE Kelly Caleche and have drained one bottle (one of my victories!). 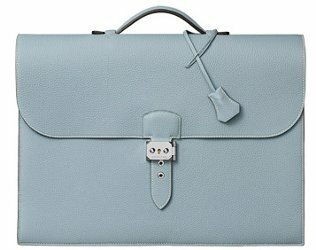 The briefcase is not my style but is a thing of beauty all the same…and a perfect color. This definitely intrigues me now; when the news was first out, I thought it would be sort of a Kelly Calèche remix. KC is a nice scent, but I don’t need another variation of it. The hawthorn and heliotrope reference definitely gets me interested. My absolute favorite is Vanille Galante, but I’m a huge fan of so many Hermès scents. I can’t think of what I’d like to next see in the Hermessences series: maybe a violet. Vanille Galante is a wonderful scent, and another I don’t remember to wear as often as I should. I also keep forgetting I own the Kelly Caleche EdP, which I do like better than the EdT (although I like that too). Will try to remember to layer it with the Cuir d’Ange later this week and see how it goes. This sounds gorgeous. I will have to overcome my pudeur and enter a Hermès store, which I always feel underdressed for. I think I would love Osmanthe Yunnan, Vétiver Tonka, Vanille Galante, Brin de Réglisse and this leather one. I actually get quite a bit of leather out of Kelly Calèche (EDT). And I second you on the Jasmine, after all he created the wonderful First and the lovely La Haie Fleurie. I wouldn’t mind a Mimosa one either. And wouldn’t it be fun if JCE did this real powerhouse of a Tuberose fragrance? Different Hermes boutiques have very different auras…my local one is less friendly than the flagship in NYC. Apparently the one in Brussels is very nice so I should just go in there. I bought a 15 ml of this on ebay yesterday, can’t wait to get it! I am a huge fan of JCE and L’eau d’Hiver is one of my favorites……so a mutation of that with suede? Heliotrope and hawthorne? Count me in. I want to see something done with galbanum. I’ll be he would make something absolutely amazing with a bitter green. Or tiare. It would be interesting to experience a Hermessence tropical-inspired scent and I would love a tiare that didn’t knock you over and was just an inspiration for the scent rather than necessarily having a huge starring role. Yes…a bitter green to replace his early fragrance Eau de Campagne, which no longer smells like it used to! Plus, it had tomato leaf, although it’s way less noticeable than it was. Hmm … will test it but I disliked Epices Marines. I was surprised I didn’t hate EM. I’m not a big fan of L’eau d’Hiver or Kelly Caleche but generally love JCE’s work so am still looking forward to trying. The tobacco and hay suggestion sounds fantastic too. But I wonder if they’ll continue adding new Hermessences once JCE departs? I didn’t care for this one at all, but then, I dislike most JC Ellena scents, especially the last 3-4. It didn’t smell like leather to me, just odd chemical odors, which is what I got from Jour d’Hermès as well. Oh well, more money saved! Yep…at this point, it makes me happy when I don’t like something. A different kind of happy, but still. Finally got to try this one (but of course they didn’t even have Left Jardin de Monsieur Li, let alone the home fragrance line!) and I’m wowed. I couldn’t picture this one in my head but I totally understand now. Thankfully it doesn’t remind me of L’Eau d’Hiver, which I mentioned above not caring for. I’m surprised that it actually smells leathery after trying Kelly Caleche. Not one I need 100ml of it but maybe a 15ml bottle. An hour later it’s already fading fast. They had one of the spendy candles in my local Hermes boutique, and I am not kidding when I say it smelled like absolutely nothing. Either they are very weak, or it was perfumed with some substance I am utterly anosmic to.